Slicing cucumbers, or garden cucumbers, are 6-10 inches long with smooth, dark green skins with a crisp, crunchy texture and a mild, refreshing flavor. Cucumbers are most often used raw in salads, sandwiches and sushi rolls. Thick skinned cucumbers may need to be peeled. There is no need to remove the seeds unless they are hard and overdeveloped. 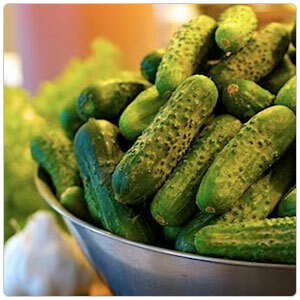 Avoid dressing cucumbers in advance as they will give off too much water and dilute the flavor of the dish.